Today we are interviewing Dr. Sam Sunshine about the benefits of VO2max testing. Dr. Sunshine is a local Family Medicine and Sports Medicine physician who is also an avid triathlete. So Dr. Sunshine, for our athletic audience, what is VO2max testing? Dr. Sunshine: VO2max testing is an in-office performance test that measures how well your heart and lungs process oxygen. The results of your test will provide valuable information about your metabolic capacity as an athlete, including your lactate threshold. Dr. Sunshine: Lactate threshold is the point while exercising that your body switches from metabolizing both fat and carbohydrates for energy to utilizing only carbohydrates for energy. Once you cross the lactate threshold, you begin tapping into a limited reservoir for fuel, your glycogen stores. Because we have limited glycogen stores but unlimited fat stores, it is beneficial to remain at or below our lactate threshold during long bouts of exercise such as an endurance race or while performing recovery training. 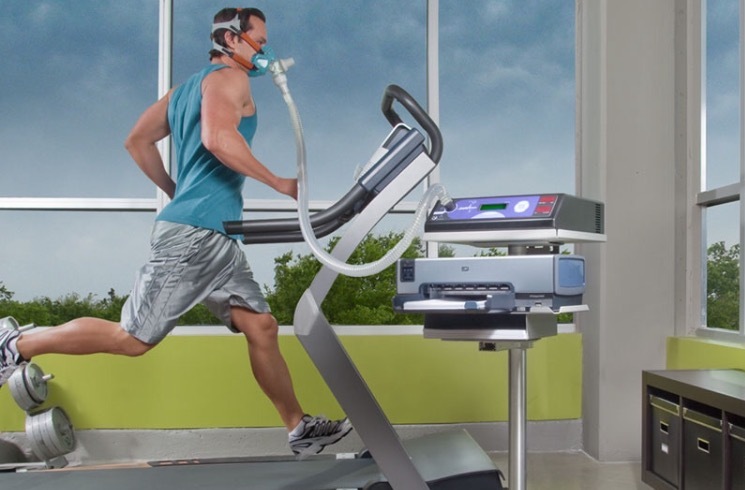 What are the benefits of VO2max testing? Dr. Sunshine: Understanding your VO2max and lactate threshold can help you train and race smarter. Knowing how your unique body processes carbohydrates and fat can help plan your training, pace your event efficiently, and select proper nutrition. VO2max testing will also determine your training zones. Why is it important for an athlete to know their training zones? Dr. Sunshine: First and foremost, it is important for endurance athletes to realize that most of their training should be in the lower zones. Keeping our heart rates in the lower zones will help us reduce over training, burnout, and injury rates. Most coaches utilize training zones for their athletes when developing a seasonal or pre-race training program to ensure maximal performance gains during that period. What is the added risk of injury when an athlete trains without knowing their training zones? Dr. Sunshine: Injuries most common to endurance athletes are overuse injuries. These injuries can result from improper equipment, overzealous training, or insufficient recovery. Adhering to a prescribed training program with training zones will help limit over training and, as a result, help reduce frustrating overuse injuries that can not only disrupt short-term training goals, but long-term goals as well. I understand that VO2max testing can be expensive. Dr. Sunshine: We perform VO2max testing in our medical clinic, and are the only medical clinic in Orange County to offer this service. If you have PPO insurance, we are able to bill the testing through your health insurance. The only caveat is if you have a high deductible that has not been met. Our pricing without PPO health insurance is very reasonable.